The decomposing bodies of 58-year-old Cuban physiotherapist, Guillermo Valintin Martinez Stable, and a 47-year-old woman identified as Usawatie Persaud, were found in a bottom flat apartment at Lot 136 Eping Avenue, Bel Air, shortly after 14:00 hrs yesterday. Police said that the naked and mutilated corpse of the woman, Usawatie Persaud, of Main Street, New Amsterdam, was found on a blood-soaked mattress in the hallway of an apartment that Martinez had rented. A hearse prepares to take the bodies away. Police said that Persaud’s body bore five stab wounds to the throat, chest and stomach. Detectives made the identification after finding Persaud’s passport and other documents at the scene. The body of Martinez, which bore no marks of violence, was found on a bed, clad in a pair of three-quarter pants. Police are working on the theory that the Cuban murdered Persaud before taking his own life. From the state of the remains, investigators suspect that Umattie Persaud was slain several hours before the Cuban took his own life. Persaud’s son told Kaieteur News last night that he last saw his mother around noon on Wednesday. According to the 27-year-old son, his mother informed him that she was going to Georgetown to the High Court. 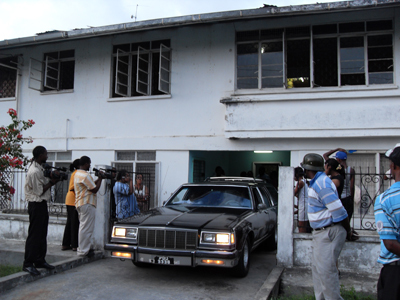 After she failed to return, he travelled to Georgetown and reported her missing to the Brickdam Police Station. He said that he has since informed his sisters who reside overseas. 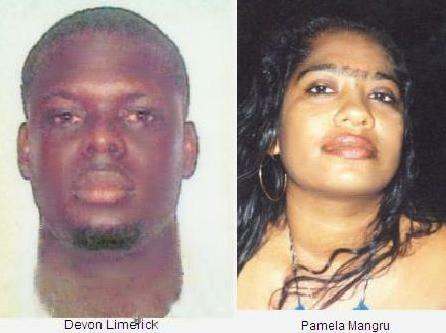 These siblings are travelling to Guyana. The son, who said that his name was Steve, confirmed that his mother knew a Cuban ‘doctor’, whom she would occasionally visit. 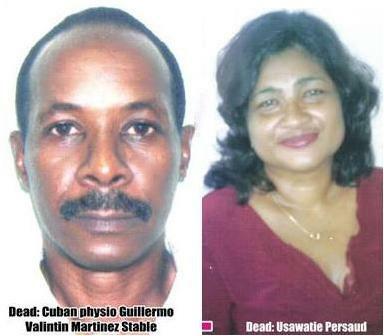 Persons who knew Martinez said that the Cuban national has been living in Guyana for some six years. He had occupied the Bel Air apartment for about four years. The shocking discovery was made shortly after 14:00 hrs yesterday after persons who came to see the physiotherapist over the past few days got no response after calling repeatedly at his apartment. “People been coming over the past four days calling for ‘doctor’ to get their physiotherapy done, but they were not getting any answers from the door,” one woman said. A woman who worked in the area said that she last saw Martinez on Monday. “After Monday I ain’t see he then early this morning a woman came with a child to do physiotherapy but she ain’t get no response so she left after gaffing with me,” the guard said. Eventually, the elderly woman who owns the building summoned the police, who entered the apartment and found the decomposing remains. The bodies were eventually taken to the Lyken Funeral parlour at around 18:00 hrs. A Cuban colleague of Martinez expressed shock after visiting the area and learning of the tragedy. He stated that Martinez had been working in Guyana as a physiotherapist for more than six years. The distraught man described Martinez as a “friendly” person. The friend, who recently returned from Cuba, said that Martinez would sometimes give him money to send to Cuba for the physiotherapist’s daughter.